From humble garlic and ginger to shimmering reishi mushrooms, vivid wolfberries, and knobby bitter melon, many Asian ingredients carry powerful healing properties. As scientific studies reaffirm Chinese Traditional Medicine and India’s Ayurveda system, food and beverage companies unveil esoterically flavored waters, confections, smoothies, and other trend-setting products. (Turmeric-holy basil-winter cherry chocolate, anyone?) For generations, though, Chinese and Indian cooks have valued seasonal ingredients, mind-body balance, and individualized health needs as much as flavor and texture when preparing meals. The Asian Culinary Forum will gather chefs and entrepreneurs, scholars and clinical specialists for a lively discussion about the power of healing foods. Tastings of special foods and beverages will also be offered. Nancy N. Chen is professor of anthropology at the University of California, Santa Cruz. A medical anthropologist, she examines cultural practices of self-care through eating and medicating. Her recent publications include Food, Medicine, and the Quest for Good Health (2008) and the co-edited volume Asian Biotech: Ethics and Communities of Fate (2010). John Garrone, who received a proclamation from the San Francisco Board of Supervisors designating him San Francisco’s “Official Mushroom Man,” became involved with mushrooms in 1977 while working for the City of San Francisco on the Police Officers' Association Gym in Hunter's Point shipyard. There he met a man who grew mushrooms, with whom he eventually became partners in a business called Miracle Mushrooms. In 1987, John and his wife, Toby Garrone, partnered with Jim Hammond, who started Hazel Dell Mushrooms in his garage. By 1990, consumer demand for exotic mushrooms necessitated a move out of the garage, and the business relocated into a decommissioned White Button cultivation facility in Watsonville. That facility is now home to Far West Fungi. Vinita Chopra Jacinto has been involved in the food industry for over three decades. She has extensive experience in culinary education, hotel management and nonprofit services. Vinita has been a culinary instructor at the California Culinary Academy in San Francisco for over six years, teaching classes that focus on contemporary and health conscious cuisine. Prior to working at the Academy, Vinita was the manager and lead instructor of CHEFS, a program dedicated to fighting homelessness through employment in the food services industry. Vinita graduated with her degree in catering technology and applied nutrition from The Institute of Hotel Management in Mumbai, India. Her areas of culinary focus include vegan and vegetarian cuisine, Indian cuisine, sustainable food and nutritional cooking. In addition to her love for all things food, Vinita is a certified Yoga instructor. She has a passion for tea, local food movements and incorporating old food wisdom into younger generations. New to the blogosphere, Vinita posts recipes and culinary musings at culinarysmart.wordpress.com. Jane Lin launched Mama Tong shortly after having her second child. Her inspiration came from the soups her parents prepared to help her recovery from childbirth. Jane is a Northern California native, having grown up in Santa Cruz and the Peninsula, and then settling in the East Bay after graduating from at University of California, Berkeley. It was at Cal where she met her husband Andy and completed a bachelor’s degree along with two master’s degrees in architecture and city planning. Twelve years later, Jane had her first child, a boy, and was introduced to the world of post-partum, Asian “confinement” foods. Nowadays, Jane can be found wandering the aisles of 99 Ranch and the streets of Oakland Chinatown, looking for the special ingredients for her soups carrying her baby girl in a sling. By starting Mama Tong, Jane now feels more closely connected with her culture, community, and family. Michelle Warner is certified as a Clinical Ayurvedic Specialist by the California College of Ayurveda. She has continued her studies with Dr. Vasant Lad, including a clinical internship in India in 2007. She was previously a practitioner and herbalist for Elephant Pharmacy. Michelle currently has a private practice in the East Bay incorporating herbs, nutrition and lifestyle counseling, and body therapies. She strongly believes that food is our best medicine and that many remedies are in our kitchens. Ayurveda places emphasis on self-understanding so that we may each become our own healers. Our events always sell out so we highly recommend you purchase tickets in advance. As our Food As Medicine event approaches on April 19th, we’re excited to share a special recipe for black sesame sweets from one of our panelists. We’re looking forward to what our expert speakers have to share about the complex, fascinating topic of using Asian ingredients and methods for their medicinal and healing properties. As scientific studies reaffirm the thousands-year-old techniques of Chinese Traditional Medicine and India’s Ayurveda system, food and beverage companies unveil one trendsetting product after another. For generations, though, Chinese and Indian cooks have valued seasonal ingredients, mind-body balance, and individualized health needs as much as flavor and texture when preparing meals. 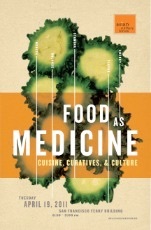 We hope you’ll join us on April 19th to learn about the old and the new in food as medicine. In the meantime, enjoy this easy, fortifying treat recommended by Michelle Warner, Clinical Ayurvedic Specialist. Try it at home and please let us know if you have any questions about the ingredients. We look forward to seeing you on April 19th at the SF Ferry Building. Michelle Warner, Clinical Ayurvedic Specialist, inspired by Amadea Morningstar’sThe Ayurvedic Cookbook, recommends this simple, tasty, no-bake treat as a nourishing, high-protein snack that does not spike blood sugar as refined sweets can. It is especially appropriate for dry or deficient constitutions under the Ayurveda system. Black sesame seeds fortify the bones, are warming and moistening to the body and are very grounding. They also strengthen the blood, liver and kidneys. 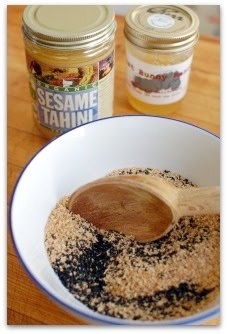 1In a blender, coarsely grind the sesame seeds; transfer to a medium bowl. Grind the sunflower seeds to a rough powder in the blender; add to the sesame seeds. 2In a small, heavy skillet, toast the wheat germ over medium-low heat, stirring frequently, until light golden brown and slightly fragrant. Add the wheat germ to the ground seeds along with the honey, sesame butter, vanilla, cinnamon, cardamom and salt. Stir with a wooden spoon until all the ingredients are evenly incorporated and a stiff, crumbly dough forms. 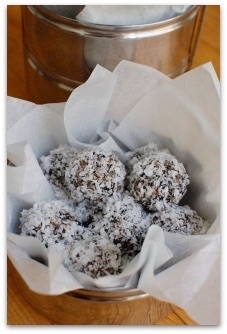 3Press the dough into 1-inch balls and roll in the coconut to coat. Variation: For a wheat-free version, substitute an additional 1/2 cup of roughly ground sunflower seeds for the wheat germ.